Enjoyable slice of neo-noir with a gritty script, intriguing characters, a strong sense of location and superb performances from its two leads, though it's slightly let down by finale that can't decide how dark it wants to be. Directed by Ami Canaan Mann, Texas Killing Fields stars Sam Worthington and Jeffrey Dean Morgan as small-town Texas homicide detectives Mike Souder and Brian Heigh. While investigating the murder of a local prostitute, Souder and Heigh discover that a brutal serial killer is dumping his victims in a nearby marsh known as The Killing Fields that lies just outside of their jurisdiction. When Mike's ex-wife Pam (Jessica Chastain AGAIN) - a detective in the next county over – asks Brian for his help, he becomes gradually obsessed with solving the case, despite Mike's repeated warnings to leave well alone. However, Brian's investigation brings him to the attention of the killer, who targets Anne (Chloe Moretz), a troubled local girl Brian has taken under his wing. 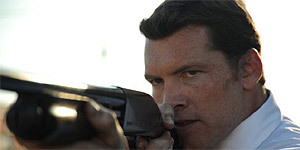 Sam Worthington delivers his best performance to date as Souder, creating a well-rounded and believably flawed character (he's given to bouts of RAGE). Morgan is equally good as a good man driven dangerously close to the edge by his obsessions and there's colourful support from Moretz, Chastain and Sheryl Lee as Anne's deadbeat mother. The script is excellent, with gritty dialogue and a strong sense of place, heightened by superb cinematography from Stuart Dryburgh, who somehow manages to make desolate marshland look beautiful. There's also a superbly atmospheric score from Dickon Hinchcliffe. The Bad The main problem with the film is that it can't quite decide just how noir-ish it really wants to be, so while one element of the finale is thrilling and brilliantly staged, there's another element that feels like a cop-out or, worse, an ending that was rewritten to appease moronic test audiences. Similarly, Jessica Chastain is frustratingly under-used – Pam is introduced as an extremely strong character (slamming a witness against the wall just for smirking, etc) but she's given disappointingly little screen-time overall. Texas Killing Fields is an enjoyable thriller that's a shade darker than the usual Hollywood fare, thanks to a gritty script, intriguingly flawed characters and strong performances from a superb cast. Worth seeking out.